This is the 150ml container with child proof cap plus a free application spout, perfect for your reloading room. This product is UK produced specifically for the UK and European market and we believe it is currently the best on the market when it comes to stripping copper plus it has the added bonus of removing carbon as well. 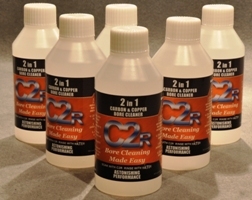 C22R is a water soluble ammonia free product that will not harm rifle barrels or finishes, what it does do is clean your barrel without the need for bore brushes, just use patches soaked in C2R and finish off with water soaked patches followed by a light gun oil of required.